There are very few desert foods that are as universally loved as fresh Medjool dates. I used to consider dates as little more than another barely edible dried fruit added to American Christmas cakes, which I don't care for much. I didn't really appreciate them fully until in the summer of 1987 on a road trip with a small group of high school friends I was forced to pull into a roadside farm market on route 86, 50 or so miles north of the Mexican border with an overheating engine. The market was associated with a date ranch that we had been driving by - unnoticed as our attention was focused on the wavering engine heat indicator which was only being kept from a boil over by our willingness to run the heater all out on this 104° day. Once reserved exclusively for Moroccan royalty and their most important guests, Medjool dates were considered a precious confection and for many remain so today. We pulled into the market to give the car some time to cool off, while we wandered down the market aisles and pondered the idea of a "Date Shake". The heat may have helped me decide that day to go ahead and order that five or six dollar date shake, and I remember well waiting in anticipation as the girl with the long brown hair put it together, three or four scoops of french vanilla ice cream, a good sized scoop of a date paste (I was later to learn it was Medjool date paste) and a splash of milk. I imagine now the buzz of the burr inside the frosted stainless shake cup, before she half poured, half scooped my date shake, now a rich carmel brown into a paper cup. It was even more thick and smooth than I'd anticipated, with chewy bits of date skin and an intense carmel and honey flavor. The cold made the pieces of date in the shake chewier, somehow even more satisfying as they softened under my bite - I was quite literally smitten with this first real taste of fresh dates, and before I left the market I had spent twenty five dollars on soft, fat Medjool dates, some wrapped like truffles in thin colored foil, others pressed together in transparent plastic cartons. Our road trip sent us north - away from the fertile date plantations of the south, so there were to be no further forays into date shakes on that trip, and before we made it home - the dates I had purchased, even the fancy foil wrapped delicacies, were long since gone; eaten around fires at campsites, or warmed on the dashboard with morning coffee in San Luis Obispo. Date seller in the old souq in Kuwait City, surrounded by dates from Kuwait, Iran, Saudi Arabia and elsewhere. The origin of the date palm is lost in antiquity. Dates have been a staple food of the Middle East for thousands of years. They are believed to have originated in the Persian Gulf area, and have been cultivated for thousands of years in the Middle East. Known cultivation range from Mesopotamia to prehistoric Egypt. There is archaeological evidence of date cultivation in eastern Arabia in 6000 BC. Dates and date cultivation gave a means of existence to thousands of people. It was said to offer man a thousand uses including thread, needles, baskets, lumber, mattresses, rope, numerous other household items and an integral part of their diet. In culinary terms dates are equally versatile and Medjool dates are particularly wonderful, deep amber to almost red in color, with a slightly wrinkled skin. The flesh of the fruit is immensely satisfying, sticky and thick, they are rich with flavors of wild honey, carmel, and cinnamon. Cooled they are slightly harder to the tooth, warmed they are like some decadent pastry, almost cloying in their sweetness. Dates hang from the crown on a date palm. 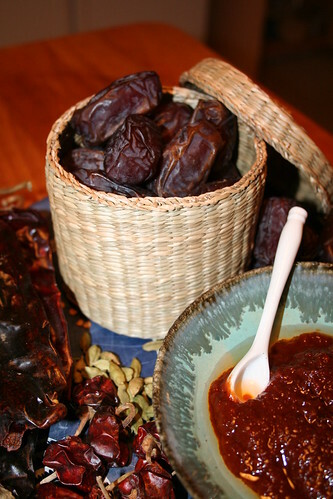 In today's recipe I offer a wonderful (and spicy) smoky date chutney. Dates make a wonderful base for many chutneys adding a thick body and great base sweetness. 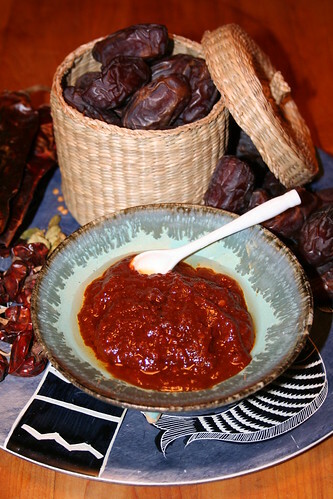 Many date based chutneys work well with yogurt, and are wonderful with eggplant and pork dishes. A fiery, sweet and complex chutney that will make you stand up and take notice. Great with yogurt, on eggplant or pork dishes. Not for the faint of heart! 6 pickled chipotle chiles in adobe, rinsed quickly to remove extra pickling sauce. 1. Combine all ingredients except olive oil in a food processor or blender and puree until mixture forms a paste. 2. Scoop into a preheated double boiler and heat for 15 to 20 minutes stiring frequently, adding 2 tablespoons of water after 10 minutes. 3. Cool before serving, serve at room temperature topped with olive oil.